The Oregon Cliff House is located in the middle of the most popular section of the Mckenzie River for rafting and fly-fishing. Whether you would like to do one of these activities or go skiing, golfing, hiking or mountain biking, this world class outdoor mecca is all at your door step. Eugene and the University of Oregon is also only 45 minutes away if you are coming for graduations, sporting events or the Oregon Bach Festival. Please use the following information to help choose activities you are interested in doing and places that you are interested in going. You can click the links to get more information and book services directly with any of these vendors. We are not affiliated or commissioned by any of them, but have had a great experiences working with them. We think you will, too. The McKenzie River is famous for old growth trees, clean water and outstanding fishing. Take a guided trip down this pristine river in a drift boat and experience the tranquility of gorgeous scenery and catching fish! The Helfrich's have been taking people down the river since 1925. Please call 800-507-9889 for pricing and details. Offering fishing trips for Rainbow Trout, Steelhead and Salmon. Please call 425-286-4282 for pricing and details. 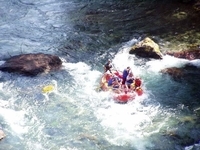 Experience the thrill of whitewater rafting! From the upper Mckenzie river to Martin's Rapids, you will float through old growth forests, endless natural scenery and exciting whitewater. The Helfriches have been taking people down the river since 1925. 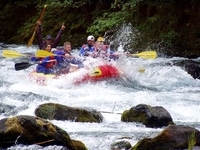 They offer rafting trips for groups of all sizes and people with all levels of experience. Please call 800-507-9889 for pricing and details. Offering rafting trips for groups of all sizes and people with all levels of experience. Please call 425-286-4282 for pricing and details. Mckenzie River trail is a spectacular 26 mile long trail that follows the mcKenzie River from its head waters (Clear Lake) in the Cascade Mountain range. Highlights include multiple grande waterfalls, lava field, old growth forest, and the beautiful Blue Pool. The beauty of the trail is world famous drawing hikers and mountain bikers from all over the world. Tokatee golf course is located about 20 minutes up river from The Oregon Cliff House. It offers an incredible mix of postcard vistas and championship golf. Designed by renowned architect Ted Robinson, this 18 hole course is golf in the rugged outdoors with straightforward holes that are enhanced by their views of distant mountains and their use of native ponds and streams. The course is easily walkable and is consistently ranked in “Best Courses in Oregon” by Golf Digest. Belnap Hot Springs is a private resort located about 20 minutes up river from The Oregon Cliff House. It is open to the public. They have two mineral hots springs that were originally developed in 1869 by R.S. Belnap. 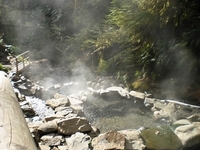 The Hot Springs are across the river from the resort but are piped over into a large swimming pool right on the edge of the river. They also have many acres of gardens, including their extravagant secret garden that uses diverted water from the river to create a very unique place. Cost for the hot springs pool is $8.00 per hour per person. The gardens are free to walk. Cougar Hot Springs is about 45 minutes up river from the Oregon Cliff House. Located in a ravine, deep beneath old growth forest, there are five pools of hot water ranging from 112 degree down to 90 degrees that are fed from a small cave. 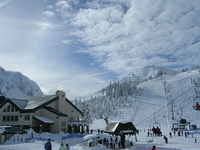 It is a half mile hike from the parking area and cost $6.00 per person. Clothing is optional and it can be crowded on the weekends. It is best to go weekdays and in the mornings if you want a more private, serene experience. Located about 8 Miles down river from The Oregon Cliff House, the Leaburg Hatchery was built in 1953 to mitigate lost fishing opportunity due to the many dams built in the Willamette basin. The hatchery rears rainbow, cutthroat and steelhead. Visiting hours are dawn to dusk, seven days a week. I have heard they have a huge stergeon in there show pond! Located 10 miles down river from The Oregon Cliff House, Organic Redneck Farm Stand offers seasonal fresh vegetables and fruits from their farm. If you are staying with us in July, the blueberries are awesome and are only $2.50 per pound for you pick!